It seems hard to believe, but David “Ziggy” Marley, eldest son of the late reggae legend Bob Marley, will be celebrating his 30th year as a recording artist next year—a span twice as long as that of his father, who died at age 36 in 1981. The six-time Grammy winner, who recently picked up his second solo Best Reggae Album award for his 2013 live set In Concert, keeps the rich family legacy alive with his latest album Fly Rasta, his fifth solo studio recording since the disbanding of Ziggy Marley & The Melody Makers, a family based band featuring his siblings Cedella, Stephen and Sharon—which won three Best Reggae Album Grammys during their 15 years together in the ’80s and ’90s. Like all of his previous solo albums, including his other Grammy winner Family Time (Best Musical Album For Children), Fly Rasta is being released on April 15 on Tuff Gong Worldwide—an offshoot of a label originally founded by Bob Marley’s band The Wailers in 1965. In 2011, while releasing another Grammy-nominated solo recording, he produced his first ever comic book “Marijuanaman,” in line with his ongoing advocacy for the legalization of pot. 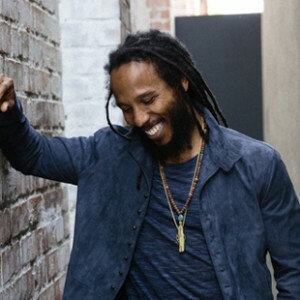 He launched Ziggy Marley Organics, a GMO-free product line including flavored coconut oils and hemp seed snacks, in 2012; the products are distributed throughout the US and are available in over 1000 stores nationwide. Marley is also known for his varied humanitarian work, including the founding of Unlimited Resources Giving Englightenment (URGE), which works to help children in Jamaica and Ethiopia, and supporting Little Kids Rock, a nonprofit that provides free musical instruments and free lessons to public school children throughout the U.S.
A family reunion of sorts takes place on Fly Rasta, with Sharon and Cedella Marley appearing together on a Ziggy project for the first time since his 2003 solo debut Dragonfly, and Erica Newell, a backup singer on all the Melody Makers tours, being featured as well. Another unique element is the singer’s decision to bring a fresh voice on to co-produce, just as he worked with Don Was on Wild and Free in 2011. This time he tapped Dave Cooley, a veteran mastering engineer and owner of Elysian Masters, whose resume as an independent artist producer includes J Dilla and Silverspun Pickups. “With every album, I bring in songs that I have written over a certain period of time, and the goal is to make a really good sounding album that tries to push the boundaries and carry the music forward,” says Marley. “Fly Rasta is a little futuristic for me in that it tests the limits of traditional reggae musically while lyrically I’m writing a lot in these 10 songs about overcoming obstacles. They’re based on some of the tougher times I’ve been through and some require listeners to read between the lines to get at the deeper meanings. It’s been many years since I sang with both of my sisters and Erica, so I wanted to bring their distinctive style to the new album as well. featuring Marijuanaman graphic artist Jim Mahfood. In light of the reappearance of marijuana in the national news as both Colorado and Washington have legalized recreational use and the fact that 20 states and the District of Columbia now have medical marijuana laws on the books, Marley’s comic book “Marijuanaman” is proving very timely. He released a pro-marijuana song in support of the ultimately defeated California’s Proposition 19 ballot initiative to legalize recreational pot in the state. “Wild and Free,” featuring actor Woody Harrelson, was the title track of the singer’s 2011 album. “I’m confident that once the truth gets out about the medical benefits and the more positive aspects of recreational marijuana use, the demonization of the plan will be less and that truth will basically set the plant free,” says Marley. “There are a lot of old stigmas still attached to it that are rooted in an embedded ideology that has been part of the American political system for years. There are just certain elements of our society that would rather not believe in the value of marijuana and hemp so they continue to oppress and demonize it.